I don’t know about you, but I’m feeling… like some good ole soul food mixed with a breakfast favorite. If you like eggs benedict and fried chicken, I recommend stopping by Brenda’s for brunch! You won’t regret it and you can even enjoy some of their famous beignets while you are there (as well as their abundant selection of other choices)! If you like a more traditional breakfast, well here is it! One of the premiere brunch spots in San Francisco which boasts a vast array of brunch options, but this right here takes the cake for one of the best they have to offer. If you are a huge fan of lemon ricotta pancakes, you need to come and taste these yourselves. With a plate full of flavor and a great accompanying cast for the pancakes, Plow will leave you wanting to come back as often as possible. Wait wait wait… Crème brûlée french toast? What sorcery is this? Well you heard it here! Kincaid’s offers this delectable brunch dish served up with some chicken apple sausage. If that doesn’t pique your interest, ask for in house fresh baked muffins and strawberry whipped butter. You will surely go home a happy camper after a meal here. With so many options and a changing menu, Bellanico definitely fits the bill for another high profile brunch place to visit. Along with your standard brunch plates such as french toast or eggs benedict, they serve Bomboloni, florentine doughnuts served with sage custard and bittersweet chocolate dipping sauces. If you are around the area or looking for a decent place to eat in Oakland, why not be adventurous and try it out. Sadly, Pican only serves this wonderful treat on Saturdays…but on the bright side, they do the waffle justice in terms of tasting like red velvet. Pair it up with a side of fried chicken and you get chicken and waffles. Of course when all else fails at a southern restaurant, you can go for the fried chicken alone, the southern breakfast, or grits. Overall, this is a place worth checking out. Unfortunately we do not have a picture of the short rib hash, but that is the true winner at this brunch spot. They like to keep things nice and simply for the eggs and bacon, but they will adventure and play with flavors when the technique requires more touch and refinement. The dish above, Duck confit hash, is a solid choice to go with if you choose to venture over here. Not a bad place to spend your morning to grab a bite to eat. 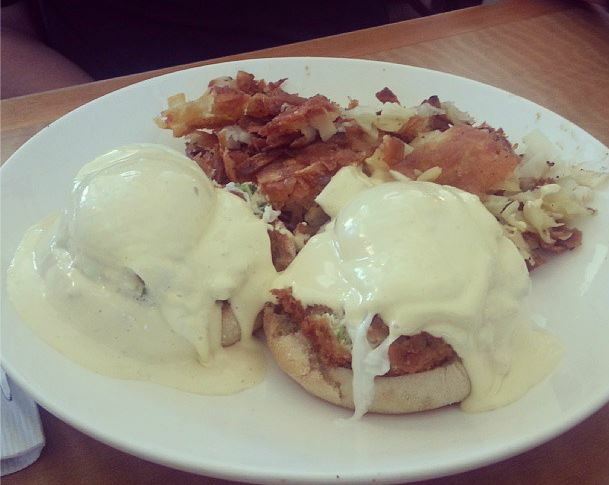 If you are looking for benedicts, then Cafe M is the place to go! They have an assortment of brunch options but they mainly specialize in benedicts and make a very delicious crab cake benedict. The hollandaise sauce on top of the crab cake just makes you want more with every bite and the softer than you’d expect hash browns are made perfectly to soak up the leftover sauce on the plate. Definitely a spot to remember and check out! Take a look at that monster! If you are looking for a quick bite to go or happen to chance around the Mission district, why not venture forth and take this beast on. Filled with hot dogs, bacon, steak, ham pork leg, sausage and egg, every bite will keep your mouth busy. If this one doesn’t fit the bill, you have the option to customize it in many ways with the variety of ingredients they have at your disposal. As an extra bonus, Anthony Bourdain frequented this shop, if that is any indication of how good this place may be. It’s been a pleasure to present to you one of our first lists of places to try. Thanks for reading and look forward to more lists to come!